Noctua is a company known for making quality and well performing CPU Coolers, some of the best on the market today surely. They’ve recently introduced a new cooled called the NH-C14 which is gets its name from the ‘C’ shape that the cooler is. The NH-C14 comes equipped with two Noctua NF-P14 140mm fans for excellent cooling performance. The two fans are mounted one on top and one on the bottom and you can configure it however you like. If you need more room beneath the cooler then just use the top fan. The NH-C14 is made to be versatile and have good performance at the same time. The NH-C14 brings top-flow cooling to a new level by offering an exquisite, uniquely flexible 140mm dual fan setup: The two supplied NF-P14 premium fans can be installed on top and underneath the fin-stack to configure the cooler for maximum performance in dual fan mode and either lower profile (105mm) or maximum component clearance in single fan modes. Bundled with the award-winning NT-H1 thermal compound and Noctua’s SecuFirm2 multi-socket mounting system, the NH-C14 is a highly flexible, premium-class top-flow solution that further boosts the renowned quiet cooling performance of the much acclaimed NH-C12P series. The NH-C14’s six heatpipe c-type design allows for superb quiet cooling performance while maintaining a much lower profile than today’s tower-style coolers and providing excellent airflow over RAM modules and near-socket mainboard components. The NH-C14 comes with two of Noctua’s award-winning, premium quality NF-P14 140mm fans that can be fine-tuned according to the user’s needs via the supplied Low-Noise (L.N.A.) and Ultra-Low-Noise Adaptors (U.L.N.A.). Noctua’s enthusiast grade SecuFirm2 multi-socket mounting provides broad socket compatibility (LGA1366, LGA1156, LGA1155, LGA775, AM2, AM2+ and AM3) and meets the highest demands in safety, performance and ease-of-use. The box for NH-C14 is nice looking as you might expect. Inside you’ll find not only the cooler but four accessory bags and installation instructions for Intel and AMD CPUs. The bags are individually labeled for you to make life that much easier. Noctua also included a support bar that affixes to the base and holds the bottom fan more securely in place. This can be used just for peace of mind or for extra support during transit. The last bag is labeled Common Parts and in it you’ll find a tube of NT-H1 thermal compound, nice Noctua case badge, screws and accessories to mount the fans in your case, an ‘L’ shaped screwdriver, four fan speed limiters and a ‘Y’ cable so you can hook both fans to one header. The NH-C14 comes with two NF-P14 fans pre-installed for you, one on top and one on the bottoms of the heatsink fins. The cooler has six heatpipes running from the base through the cooling fins. The base is flat but not exactly smooth, but that’s by design as to more evenly spread the thermal compound. 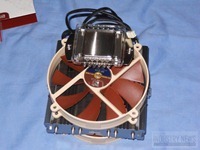 The NH-C14 is well made as we’ve come to expect from Noctua. It looks rather large but it’s lightweight for its size. It’s much thinner than I expected it to be, the fin section I mean. Here are a couple views of the NH-C14 without the fans attached. There are two square holes through the fins, these are for installation purposes, and you can pass the screwdriver down through them to secure the NH-C14 to your motherboard. I installed the Noctua NH-C14 on my Core i5 750 Socket 1156 CPU which is inside of an NZXT H2 PC Case. The first thing you’ll need to do is install the motherboard brackets. This involves a back plate, two front brackets, four plastic stand-offs, four pass-through screw style posts and four thumbscrews. You’ll need to figure out how you want to have the NH-C14 oriented in your case, either horizontally or vertically and install the brackets accordingly. I was going to install it vertically but found that it comes just a bit too close to my video card for comfort. For my testing I used no fans, one fan and two fans. When the bottom fan is attached it came very close to the Patriot Viper DDR3 ram, within millimeters really. If you have tall ram you will not be able to use the bottom fan at all if you orient the cooler that way I have it. I also found out that if you don’t install the bottom fan before mounting the NH-C14 it’s virtually impossible to get it installed then. I thought I would just run my testing without a fan and then install the fans, but after my testing I found that I had to remove the cooler to get the bottom fan attached. Before I got the NH-C14 for review I was using the Noctua NH-U12P CPU Cooler, so I figured why not compare them in this review. During testing the ambient room temperature was 24.7C (+/- .3C). I used CoreTemp to monitor and log the temperatures I got during testing. I used two instances of Orthos Stress Prime to get 100% load on the Core i5 CPU. I combined the four cores and averaged them out to get one single temperature for the chart I have below. The stock speed of the Core i5 is 2.66Ghz which I used for testing, then I overclocked it a bit up to 3.2Ghz to see how well the NH-C14 handled it. In the following chart you’ll find temperatures for the Noctua NH-U12P at stock speed and overclocked. You’ll also find temperatures for the NH-C14 with one fan, two fans and with no fans installed. I only ran stock core speed with no fan and not overclocked. So there are the results in the chart above. The NH-C14 handles the heat fairly well, better than the NH-U12P. The max temp for the Core i5 is 72.7C and as you can see, both coolers keep things below that. Having no fan it comes very close to the max temp, so I personally wouldn’t run it without a fan installed, but I did that just because I was curious. Having one or two fans installed the NH-C14 was virtually silent, it added no additional noise to my system. I didn’t use any of the speed limiters either, and it was still very quiet. If you wanted things even quieter you could slow them down of course. Once again Noctua proves that it knows the CPU Cooler business, the NH-C14 is an excellent performing cooler for sure. The NH-C14 might be large in size meaning that it might not fit in smaller cases, but if you’ve got the room then I can certainly recommend getting one to keep your CPU running cool even under the largest loads. The two NF-P14 fans do an excellent job of keeping things cool while staying virtually silent while doing it. The NH-C14 is a versatile cooler in that it can be configured to the user’s needs, be it for more room for large style ram or for more cooling performance while running two fans. I’ve been a fan of Notcua for a long time, in fact four computers in my home have Noctua coolers on them and I personally recommend them anytime someone asks what CPU cooler to buy.